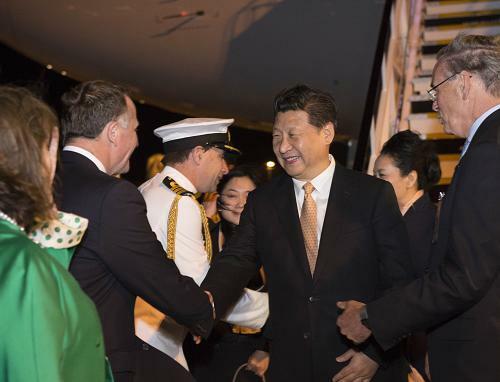 Brief：At the invitation of New Zealand Governor-General Jerry Mateparae and Prime Minister John Key, Chinese President Xi Jinping arrived on Wednesday evening in Auckland and began his first state visit to New Zealand after he took office as president last year. New Zealand Prime Minister John Key (left) greets President Xi Jinping at Auckland International Airport on Wednesday. Xi is on a two-day trip to New Zealand for talks with government and business leaders in Auckland and Wellington. It is the first visit by a Chinese head of state to New Zealand in 11 years, and Xi's second trip to the country in four years. China and New Zealand are to sign a deal which will make it easier to produce television content in the two countries, enabling the South Pacific island nation to showcase its natural landscape to lure more tourists. It comes as China's film and television industry faces stiff competition from internet-TV companies, which are spending hundreds of millions of dollars on foreign programming to attract users and advertisers. Industry experts expect increased exposure of New Zealand's rolling pastures and craggy ranges featured in the hugely successful Lord of the Rings and Hobbit films will boost the country's Chinese tourism industry, which totalled $683 million in the year ended in May. "New Zealand's landscape and scenery are a big draw for Chinese," said Henry Chung, associate professor of marketing at Massey University who specialises in China-related issues. "Even just one shot of the New Zealand landscape on television, that's worth a lot." In the past year, it was worth around 250,000 Chinese visitors to New Zealand, a tiny country with a population of 4.5 million which is recognised for its natural environment and dairy products, a far cry from China's growing urban sprawl. 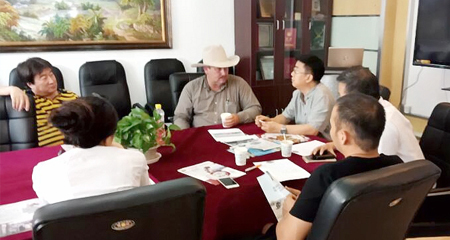 The number of visitors has tripled since 2002, the year that the first of the Lord of the Rings films was released in China, and continues to grow at a rate of more than 15 percent a year.